As the world prepares to mark the 70th anniversary of victory over Nazi Germany, Ukraine’s lawmakers have vowed to pass a “decommunization” law banning Soviet Union “symbols and propaganda”, equating beliefs of victors to those of the Nazi ideology. “Before May 9th, parliament will pass a decommunization package,”Justice Minister Pavel Petrenko promised on national television. 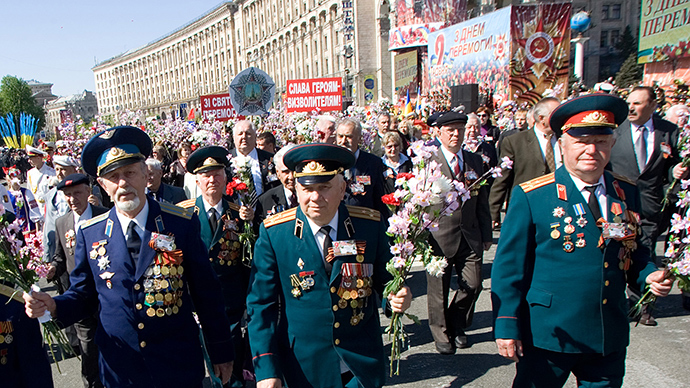 For millions of people across the world, and especially the former Soviet states, whose grandparents fought under the communist Soviet Union flags against the Nazi yoke, May 9th is the official holiday and day of celebrations of victory over Nazism. More than 27 million Soviet citizens died in the four years fighting Nazi invasion of the communist Soviet Union. Nevertheless, revoking all mentions of communism “is something we should have done 20 years ago,” the minister insists, stressing that he is “convinced that the present parliament has the sufficient political will and the votes” to effectively ban communism ideology in the country. The initiative to ban all forms of extreme left or extreme right ideologies is the brainchild of the new Ukrainian government, that is trying its best to break away from the Soviet past. The draft legislation was hammered out by the Institute for National Remembrance – a body set up by former President Yushchenko after the previous 2004 revolution and tasked with reinventing the “real” history of Ukrainian nation. The draft legislation was then pushed forward by the Cabinet of Ministers. The proposals under the new law include equating communism to Nazism but at the same time granting an official recognition to the so-called “freedom fighters” who collaborated with Nazis and eventually raped, tortured and murders thousands of their fellow nationals. The lawmakers initiative will also see the Victory Day moved to May 8th, apparently to celebrate together with “real” Europeans. And on May 9th, lawmakers hope to create a new sorrowful holiday –the Day of Remembrance and Reconciliation. Equating communism with Nazism “is a highly cynical position,” Russian Foreign Ministry Special Representative for Human Rights Konstantin Dolgov said on Sunday. He reminded that such position contradicts international law, “including the results of Nuremberg.” Dolgov also criticized Kiev for “politicized antics surrounding May 9th” calling it “highly inappropriate” given the sanctity of that day for millions of people across the globe.